Brandy added to Chef Yenni Law's secret BBQ sauce lifts her signature Meatology Ribs (RM45+) to divine gastronomic heights. Trust me, fans of swine would swoon and pick every bone clean after the first bite. This speciality and a parade of new dishes are now the top draw for Boathouse customers in Taman Tun Dr Ismail (TTDI) after the resto's recent rebirth. Chef Yenni Law who shot into the limelight with her maiden Meatology cookbook took some time to debate on changing her long established resto's name. Recently, she finally took the plunge after giving her beloved premises a fresh coat of paint and extra creative touches: framed up news clippings and stories of the chef and wine bottles upcycled into pendant lights. The upstairs space is transformed into Myth Bar, a casual drinking haven. The existing aqua-bar - a constant feature from Boathouse days - is still upfront; where creative cocktails such as White Lady (RM26+) and Slippery Martini (RM26+) continue to be whipped up and served to order. Whatever your 'poison' is, Meatology proffers an interesting array of nibbles to chew on while you nurse your drinks. We recommend the spiced fried Gizzard Frito (RM13+). Some may find the idea of chomping on fried chicken gizzard squeamish but once you get past that mental barrier, the crispy-chewy chunks are deliciously addictive. At the risk of sounding like a Bizzare Food episode, would French Escargots (RM13+) have the snob appeal for you? These epicurean delights used to send peeps shuddering with distaste but I'd like to think most of the dining public are now digging them with gusto. Heh, at least our dining party did as the toothsomely soft snails were baked with Chef Yenni's secret cream sauce and spinach. Another French mainstay is Foie Gras (RM49+) which left us smitten with its dense velveteen richness. Lavished with lashings of buttery, balsamic vinegar and brandy-infused sauce, the chunk of nearly caramelise-crusted liver was heartstoppingly good. Wading back onto safer ground, try the house cured Duck Breast Confit (RM43+). Tender with faint whiffs of smoky gaminess, the scrumptious meat induced us to wallop everything once we dribbled the citrus trinity sauce (concocted from passionfruit, orange and mango with diced strawberry) onto the duck, fresh rocket and potato mash. Yummeh! Okay, those who rather duck that offering may find greater appeal in reeling in some sashimi-grade Blue Fin Tuna (RM69+) instead. Prepared tartare-style with a lightly seared crust, the succulent, thickly sliced fish with its inherently meaty accent should float your boat when complemented by citrus ponzu sauce. Enjoy dining with some dramatic flair? Then treat yourself to a fiery performance when you order Steak on Fire (RM50+). Get your smartphones ready to roll when the waitstaff flambés a 200g Aussie tenderloin steak with VSOP brandy pepper sauce at your tableside. We asked for a medium rare steak and presto, the hunk of meat was on point when cut - superbly juicy with hints of booze to amplify the droolworthy flavours. For those who eschews beef, the delectable alternative is Swine Neck Steak Flambé (RM59+) featuring a 220g slab of pork neck meat cooked with equal finesse before your eyes. We relished every morsel of that too which had intermingling peppery, buttery and boozy nuances. As mentioned earlier, the Meatology Ribs weren't shabby either. The meat texture wasn't fall apart soft but had retained some resistant texture when we bit into it; suffusing our palate with big, deep-seated sweet, savoury and briny flavours. The heat came on in the house speciality of Fiery Ribs (RM45+) but we daresay locals would take to this like bees to honey. Smothered in a hot chunky chilli sauce similar to sambal, the meaty pork ribs covered in that reduction of red and dried chillies proved local inspired sauces would literally leave you in tears. Lots of TLC went into the Smoked Lamb Muscle (RM43+). After deboning, the 200g lamb leg is smoked in-house to irresistible tenderness before it's served with a trio of special spicy sauce, mint sauce and horseradish & pommery mustard sauce. A notable option for true-blue carnivores. Wine Flight (RM119+), proffering four glasses of white, rosé, red and ice wine to enhance your dining experience. From our sampling of the different tipples: Château de Cathalogne Bordeaux, Château de Fesles Anjou Rosé, La Closerie des Lys Rouge and Pilliteri Vidal Ice Wine, the quartet was laudable. Marmite either garners aye or nay from food lovers so when it comes to Spaghetti Marvellous Mite (RM29+), I personally gave it the thumbs up as a fan of the yeasty, umami-rich condiment. Adorned with parma ham, the savoury spaghetti in al dente perfection went down a treat. Patience is a virtue when you wish to sample Meatology's Reggae Pudding (RM17+). This treat has to made on order but the waiting time is worth it once you have a taste of the speciality. Made using fresh bread, banana, raisins, egg custard and rum then served with a scoop of vanilla ice cream, the pudding lured us with its hot-cold appeal and sublime soft-spongy-mushy textures. 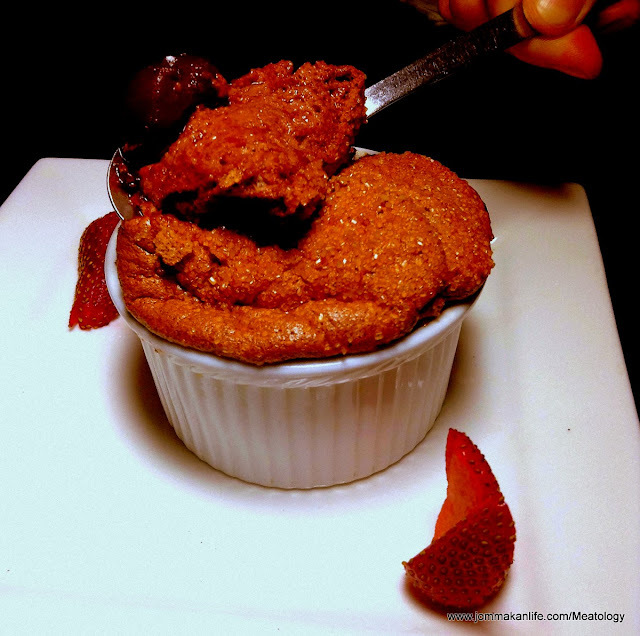 Give in to the dark side when faced with the Sinful Soufflé (RM22+). We readily surrendered once the runny chocolate and dark cherries in booze hit our tastebuds. Airy and ethereal, the chocolatey dessert left us up on cloud nine. A pool of brandy butterscotch sauce laid the foundation for Chef Yenni's decadent Date Pudding (RM18+). Never mind its plain Jane look. Once you dig in, the sticky date pudding would unleash its luscious texture and rich overtones to blow you away. Before we could recover from that sumptuousness, the chef left us buckling at the knees with her Nasty Alaska (RM23+). We never got tired of seeing the dessert up in flames. The outer meringue crust - once lightly scorched - opened to reveal a cool composition of ice cream on peanut butter-laced cake, and studded with liquor-soaked dried fruits. A most befitting finale for our latest meat-ting! For reservations at MEATOLOGY RESTAURANT, call tel: 03-7727 4426. 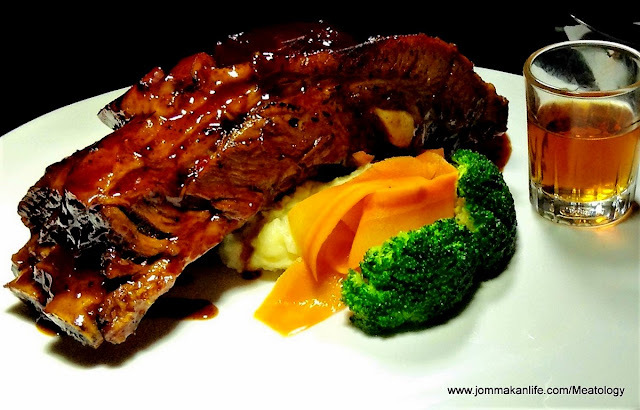 The resto is located at 16, Lorong Rahim Kajai 14, Taman Tun Dr Ismail, KL.